For those of you that don ’t know me, I enjoy travelling, and this particular trip was a calling to follow Jesus, to experience a different way of life, whilst making a difference (either big or small) to communities most in need. The flight from London Heathrow to Barranquilla took approximately 15 hours, with a layover in Miami. 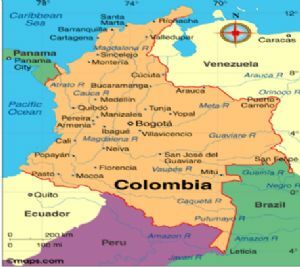 Barranquilla is in the north of Colombia, near the Caribbean Sea. I travelled out from the UK on my own and met with my team on arrival at the apartment. 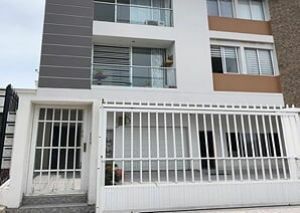 Our flat was where we lived during our time in Barranquilla. 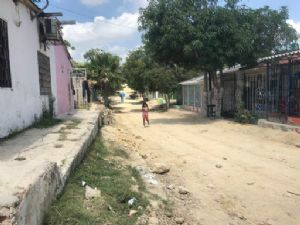 Although the entrance to the block was behind bars, the area was safe: we could walk to the shops, local park and markets, and visit people from the local church or Tearfund office. 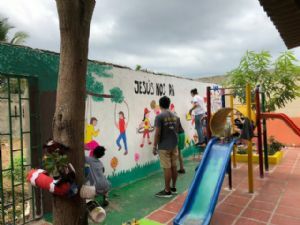 The first 48 hours felt like a rollercoaster of emotions: overwhelmed, tired, at times feeling unqualified, and having to adapt to the change in surroundings, culture, food, language and way of living. That aside, we allowed God to be our strength, guide us and open our hearts. Everyone we met was very welcoming, put us at ease and took time to talk to us, giving us all an opportunity to learn and practise our Spanish! My role was des ignated Team Leader. This is my team with Emmerson, who was our friend. From right to left - Tom, Pauline, me and Celeste. 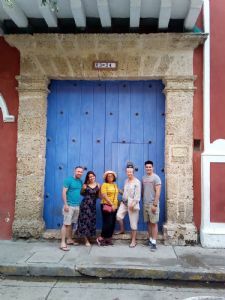 Cartagena was a neighbouring town we visited one weekend. It was a colourful and vibrant city with lots to see and do. This was one of the highlights of my trip, and if there had been more time it would have been have lovely to see more. (Left) The local area surrounding the schools that we taught. 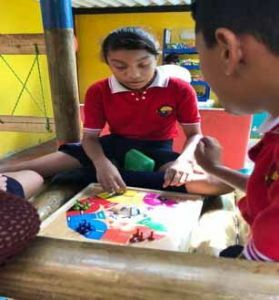 Most of our time was spent teaching English at two local schools to children between the ages of 5 to 11, using games, songs and activities, building on learning. 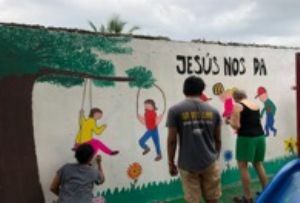 Weekends were spent teaching Bible stories at the local church, being involved in the sports ministry, and painting wall murals at one of the local schools and a community church. 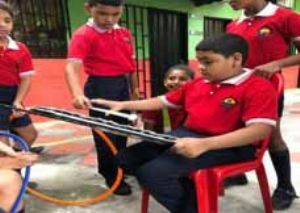 During the children's breaktime we would join them in the playground, playing board games and musical instruments. 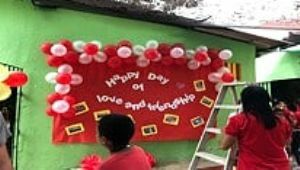 (Below) Me preparing to teach the children, and (below right) celebrating Friendship and Love day with the children. 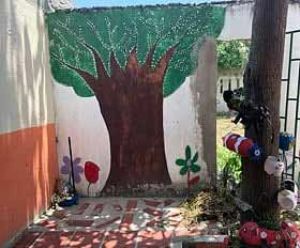 (Below) These are pictures of the wall we were invited by the school to paint. 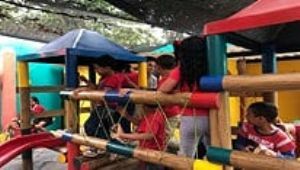 It was a grea t team effort, and I thoroughly enjoyed the experience of getting creative, using colour and words to brighten up the playground area, and also giving a reminder to the children of how Jesus teaches us to share among God’s people love, peace, hope and joy through him. 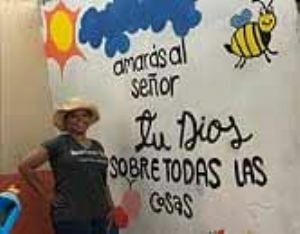 I am pictured (left) with the wording "Amarás al señor tu dios sobre todas las cosas”, which means “love the Lord your God above all things”. 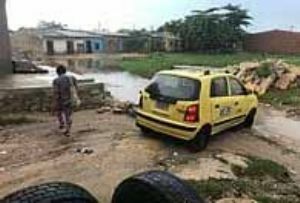 The heavens opened up just as we had finished painting, and as you can see from the picture, the taxi driver had a job getting to the school after the rain had past. It was encouraging to see these young boys (below) involved in the sports ministry. 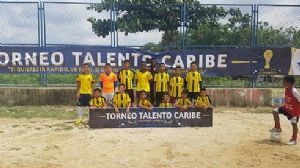 This was a great way for the partner to support young people to play in safe environments, and use sports outside of school to support their studies, combined with learning about Jesus, time reading the Bible, and reflection. 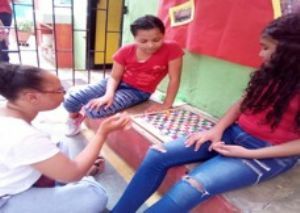 Final days at the school included celebrating Love and Friendship (below), and we put on a performance for the children based on the biblical passage from Matthew “the Friend of little children” (Chapters 18-19, also found in Mark 10 and Luke 18). It was a privilege to share our love of God, give our time, and impart some of our knowledge to children and teachers. On reflection, it was never about the destination but the journey … cliché as it sounds, God was in control every step of the way. Before embarking on this journey, none of us really knew how He would use us or what challenges we would face, but He remained faithful and showed us that, no matter how we see ourselves, he has placed gifts within all of us. He knows our hearts, and it doesn’t all have to be figured out for us to respond to his calling. Trust and have faith in him who will supply all your needs, for he is a good God! I want to give thanks and gratitude to God for the gifts and resources he so surely blesses me with: whether it’s a little or a lot that we have – money, time, knowledge, and even our ability – He entrusts to us, so that we may give back, whether in our local communities or further afield in the world. For the life, death and resurrection of Christ was for the whole world, and therefore our perspective of who our neighbour is, is a global one. And short-term missions like this are about recognising that reality. Thank you for taking the time to read this, and if you’d like to hear more about my experience, then please don’t hesitate to ask.